The Withings Pulse activity tracker is one of many similar products in an emerging market of lifestyle technologies, and one that I’ve been using for many months now. The Pulse can track how many steps you take, and how much sleep you get, but what I feel sets it apart from other products is its built in heart rate sensor located on the back. More on that later. The Pulse is very well designed. Its compact size is covered in soft-touch paint, and the easy to read display blends in with the enclosure to result in no visible bezel. Charging is via the included USB cable, and I find the Pulse needs to be charged so infrequently I really don’t know how long a charge lasts (Withings claims a two week battery life, which I see no reason to doubt). I love the compact size that fits easily into my jeans pockets, though I’m less happy about the included wristband that you use at night. It closes with velcro and there are times at night when I wake up and notice it’s loose or coming detached, requiring a bit of fumbling in the dark to resecure it. I find it’s best to start out with a pretty snug closure of that wrist strap, it’s less likely to work loose that way. The Pulse syncs automatically with my iPhone, and while it occasionally prompts me to restart the iPhone app, I find the overall sync experience to be seamless and effortless. The display acts as a simple touch screen, with the sole physical button being used to cycle between display modes. For example, to activate sleep mode, you cycle to the appropriate screen, then swipe to activate. It’s all very easy to use and intuitive. Step tracking is one of the big reasons people buy this, trying to hit a 10,000 daily step goal which is loosely based on the Surgeon General’s recommendation of 30 minutes of activity per day. It seems to work well at this, though I find the mileage calculation to be inaccurate and overly optimistic. 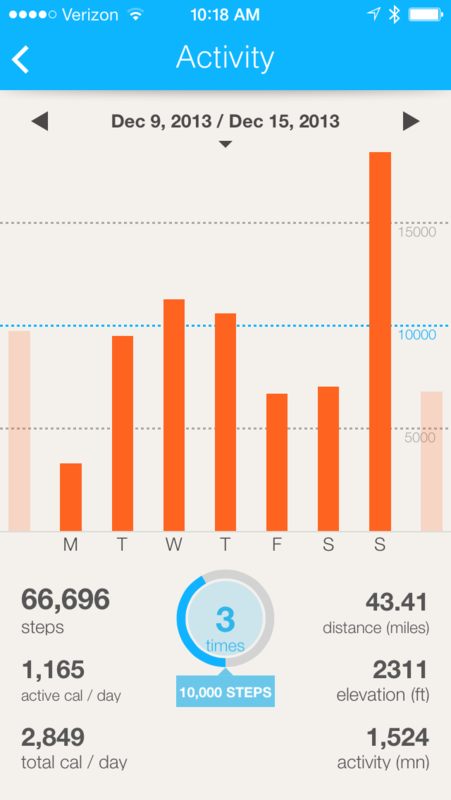 When you use the free iPhone app, you can view your step activity on a daily or weekly basis. The weekly view just shows number of steps, while the daily view color-codes the activity to represent the level of exertion – in the screenshots below, red was a nine mile jog I enjoyed yesterday (yes, enjoyed!). 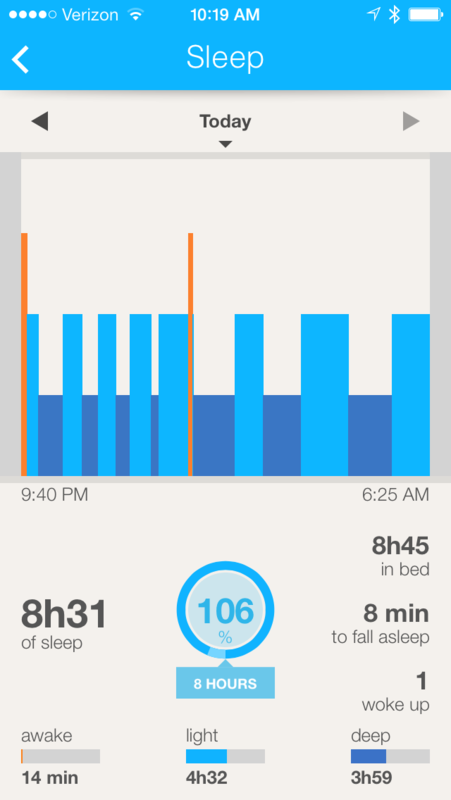 Sleep tracking is the other cool feature of the Pulse. The other activity trackers I’ve seen will tell you the amount of time you spend in bed, but to me that’s not nearly as useful as the quality of sleep you get during that time. The Pulse tracks light and deep sleep, which I assume it’s using the heart rate sensor to help detect (the wrist band has a window to provide a clear sight between the heart rate sensor and your skin). It also detects time spent awake, though I find that’s not very precise. 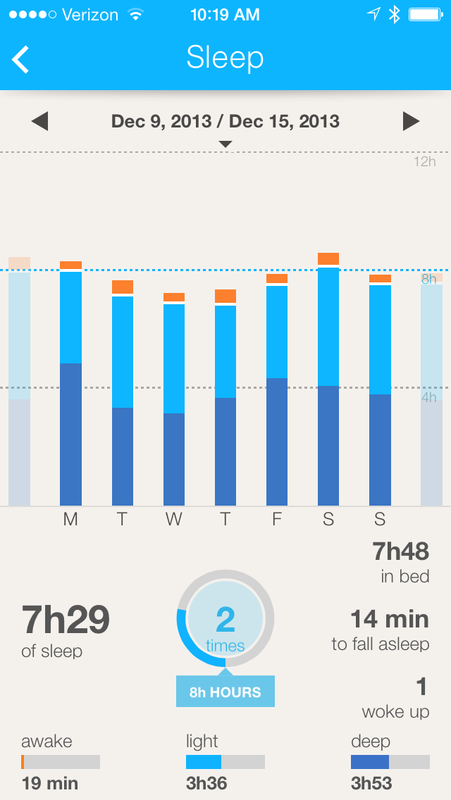 As with activity tracking, sleep tracking data is displayed as either weekly summary, or daily view, as you can see in the screenshots below. What I find really interesting is how sometimes the amount of deep sleep I get is not very dependent on how much time I spent in bed. The sleep tracking is really cool to review, especially when you start looking for correlations between how much deep sleep you get, and how you feel the next day. It’s probably my favorite feature of the Pulse, and what really sets it apart from the other fitness trackers I’ve seen. 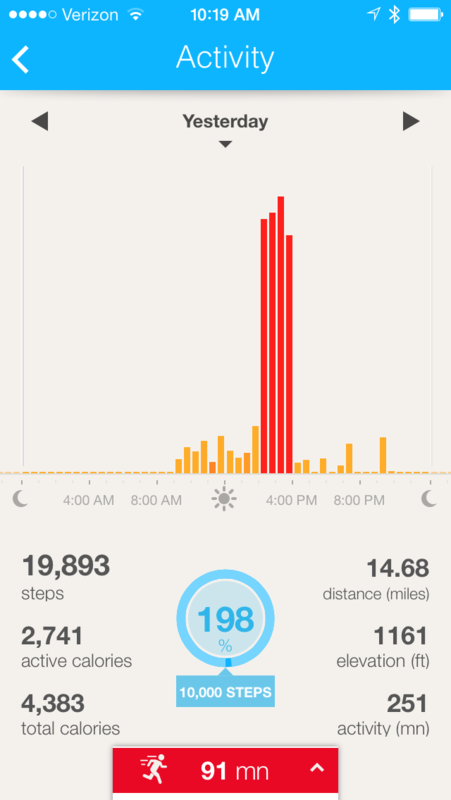 The iPhone app will also show data for heart rate measurements, though that isn’t of as much interest to me. But hey, if that’s your cup of tea, this product also works great for that! You place your finger on the rear of the Pulse and select the heart rate option on the screen to perform a quick measurement. The Pulse can be purchased for $100 from Amazon and is well worth the money, provided you pair it with the iPhone or Android App to get the most out of the data. I have concerns about the longevity of that velcro wrist strap (I worry the velcro will not hold as tightly over time), but this is such a fast-evolving technology that I expect I’ll be replacing my Pulse with a next generation product before that becomes a real issue.